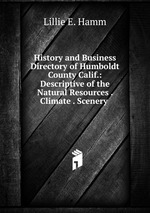 Аннотация к книге "History and Business Directory of Humboldt County Calif.: Descriptive of the Natural Resources . Climate . Scenery"